I will begin with the positives. This was my first trip to Rome, it was very exciting. I was visiting both for vacation and a conference. I booked this place and found that the apartment was clean, spacious, full of excellent amenities, and beautifully located in the town. Certainly fantastic for any visitor. The problems: I emailed the manager of the flat twice prior to my arrival to get details and arrange meeting time, checkin, transport from the airport, etc. I received no reply. When I finally landed I called the listed number and had a very difficult time getting someone to answer the phone. When i finally found my way to the apartment, i still had a hard time getting a hold of someone. Finally, someone answered the phone- the manager of the apartment. He seemed to have no clue that i was scheduled to arrive in Rome, and told me he would be by to let me in after about 45min- an hour. This was obviously frustrating. I was happy to finally be in the apartment, but my first night i found that none of the heating radiators were functional....only the small AC unit on the wall which was not very effective at all. The apartment was freezing at night. I was pretty understanding about this and called the manager to ask for help, they said they would come by to fix it promptly, this was on Tuesday morning. Nobody came to try and fix the problem until FRIDAY NIGHT, my last night in the apartment. Despite me calling everyday and telling them that the apartment was uncomfortable to sleep in. I complained about this at the end of the trip, and was given a small partial refund and told by the manager that I should have used more blankets. Overall, the trip was great and I had fun. But the lack of care on the management teams part to my complaints was the worst display of care/customer service Ive ever experienced. For these reasons, I certainly will not return to this location. My experience may have been an isolated event, but take it for what it is and consider this prior to booking this apartment for your stay. I might recommend some improvements to the lock to the apartment. It was a bit tricky to operate and seemed as though the lock was loosening in the joint. Overall a wonderful place to stay. We were very excited to stay in this apartment, unfortunately it didn't get off to a good start. On our way to the apartment, I received a message to say that the apartment's electricity panel needed to be replaced (no electricity or hot water). Massimo found another apartment for us to stay in however this was of great inconvenience as we had just come off a bus tour & had been travelling for 2 weeks & stayed in 9 different beds and were looking forward to staying in the same place for 4 days. I understand that these things happen, but it would have been nice for Massimo to help us get to the temporary apartment as we then had to lug 2 x 25kg suitcases up 4 flights of stairs! There was no apology from Massimo for this inconvenience and no offer to compensate us for the trouble. The next morning we had to drag our suitcases for 20 minutes across cobblestones to get to the original apartment. We had specifically chosen this apartment as it was close to where our friends were staying & it had an elevator. When we arrived we found that the elevator was not working & then had to once again take out very heavy suitcases up 4 flights of stairs. Over the next few days, the elevator worked occasionally & then we had to deal with a leaking water system in the bathroom. Contact with Massimo was very difficult as he would not answer my calls or messages & I would often have to call several times to talk to him. The problems were fixed as soon as possible, but this all made our stay quite complicated. The apartment itself is quite lovely, but keep in mind that there were basic things lacking like a box of tissues, no toilet roll holder in the bathroom and although there was a kitchen, there was a smelly used sponge to clean dishes & no tea towel to dry them. The apartment claims to be so much better than a hotel, but honestly, it's not. We would have been much better staying at a hotel! Everything indicated in the description and photos were very accurate. 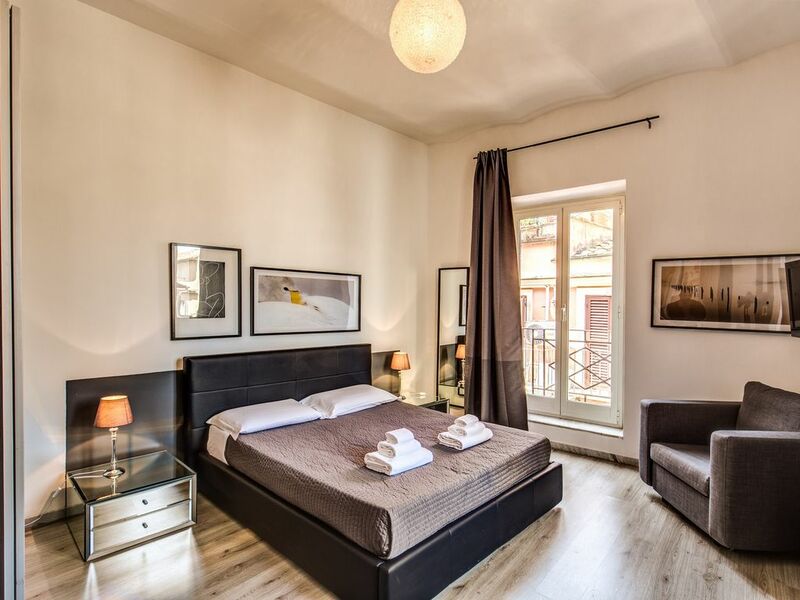 The apartment is located in the perfect spot to see central Rome. The staff were wonderful, they explained everything about the apartment very well. I would definitely stay here again. One piece of advice is to supply a kitchen towel. Many thanks for everything, I'll see you again soon. Amazing location! Apartment has everything you need. My husband and I stayed here as a first stop on our honeymoon and loved it. The location was the best part since we could easily walk to all the tourist spots we wanted to see. The apartment itself was also great; roomy and had everything we needed from coffee to a comfortable bed. We’d stay there again for sure. Thank you very much for this nice review. I am happy you enjoyed the city and my apartment. I would be happy to meet you next time you come back in Rome. There was a mix up on arrival and we had to wait a little while to be let in, but once inside we were very pleased. A small apartment, but big enough for 2 people. A very nice balcony overlooking the street below. An elevator in the building. Great location near Campo de Florio. A farmers market every day in the square and plenty of restaurants to choose from at night. A 15-20 minute walk to all the major sites. However the metro is not close. We had a great stay. Would stay again. Thanks for your kind review. The location is actually in Campo de' Fiori and as you notice is very close to the main monuments and archeological sites. The city center has no metro station in the area as it's still not possible to build any. However almost everything is walking distance and the bus system is working very well in this area. Hosting you it was also a very good experience and I would love to meet you next time. Avec son emplacement idéal à proximité du célèbre Campo dei Fiori, où la fête commence! Réveillez-vous dans les marchés du Moyen pleine de charmes et délices, et à proximité de nombreux sites les plus époustouflants de la Ville Eternelle, entouré par la vie, l'énergie, et que l'histoire prend vie que dans Rome à la main. Un lieu de rencontre pour les voyageurs et les habitants, Campo De Fiori est riche en saveur, la beauté et la vie nocturne, et est la base idéale pour vos aventures. Be sure to bring Cash upon arrival for the payment of Tourist tax and open balance if you have any. Tourist Tax of the City Of Rome: Anyone staying in any accommodation in Rome is required to pay an additional overnight tax of 3,50€ per person per night for a maximum of 10 days. Children under 10 years are exempt from payment. Check-In Out Details - Standard check-in: from h.15:00 p.m. - h. 21:00p.m. - Late check-in: € 30.00 h. 21:01 p.m. - h. 00.00 / €50.00 h. 00:01 – h. 07:00 a.m. - Standard check-out: h. 10:00 a.m.